We are back from Thailand!! It was such an incredible trip, which you might have guess from my Instagram updates and I will be posting all about it very soon, but let’s get back in to the swing of things with a new recipe. 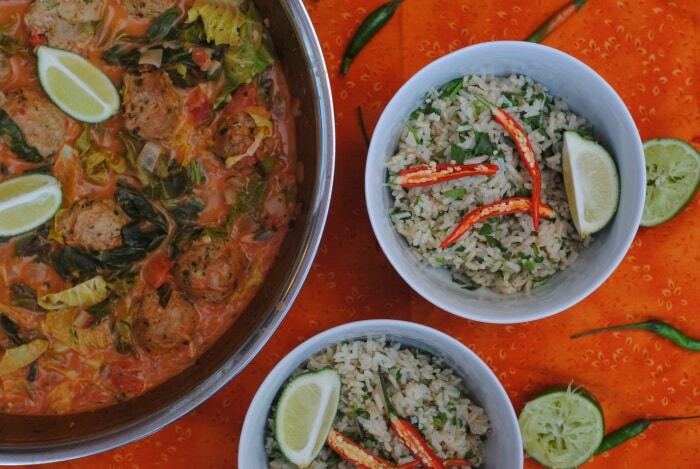 Of course it has to be this Thai Chicken Meatballs recipe. We love hosting dinner parties, although we don’t get to do it nearly as much as we would like to, and we usually host one once we get back from a trip so we can catch up with what our friends have been up to whilst we were away, and also share some stories from our travels. Don’t worry, we don’t get out our projector and have a slide show of our holiday snaps. Do people still do that? Our dinner parties have been known to get a little crazy at times, but usually later in the evening. I remember we hosted a Mexican themed dinner party once and there was way too my tequila consumed and then the guys challenged each other to a chilli eating contest. It was hilarious to watch, but it didn’t look like much fun to take part in. Although they can get a little wild, we like to keep them healthy too. Well, mostly, there is still room for some wine and dessert of course. I thought I would share some of my tips on how to host a healthy dinner party. – Make a main dish and sides that can be put on the table for people to help themselves. That way, everyone can get a portion that is right for them, and they don’t feel like they are overeating to just be polite. – Have lots of vegetable based side dishes. A big bowl of green salad with a homemade vinaigrette is always a must at our dinner parties. We also put out some steamed or roasted vegetables too. – Try to bake or grill the food, rather than frying. Not only will it be healthier, but your guests won’t feel as heavy and sleepy after eating. The worst feeling is wanting a nap during a dinner party because the food was so heavy. – Make sure your guests always have water. No doubt there will be an abundance of wine and cocktails, if it is anything like the dinner parties we go to or the ones we host, but no-one wants to be the messy drunk at the dinner party, so make sure everyone is hydrated. 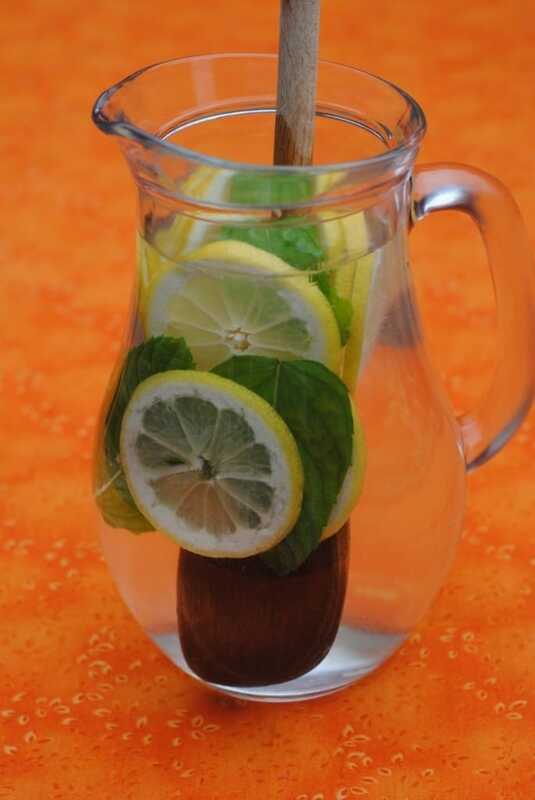 We put out a couple of jugs of infused water such as cucumber and mint or with just fresh lemon or lime. Of course we use our BRITA jug first to make sure the water is filtered and tasting as good as it possibly can. You really can taste the difference, so it is definitely worth buying a just to keep your guests hydrated with great tasting water. – Go easy on the extras. I can sometimes forget how much cheese or sauce I am adding to a dish, so it is best to put them in bowls on the table and let people help themselves. – If you are serving bread with the meal, instead of putting butter on the table, try a bowl of really good quality balsamic vinegar for your guests to dip their bread in. – Go with a healthy appetiser. I love those little nibbles with cocktails at the start of the evening, but the calories can soon add up before you have even eaten dinner. Instead, think about serving some vegetable sticks with a homemade yoghurt and herb dip. – If you are serving dessert (I am not sure why I say if. I mean when. ), then serve up a bowl of fruit salad to go with it. That means everyone can have a slice of that delicious homemade cake and have some fresh fruit to go with it too. – Finally, sit back, relax and ENJOY! Health is more than just physical health, it is mental health too. Relaxing your diet a little for one night and enjoying yourself with your friends isn’t going to do any harm. 1) Put the lemon grass, ginger, chillis, garlic, lime juice, water, coriander and soy sauce in to a blender and blend until it is a paste. 2) Put the chicken breast in a food processor and blend until it is ground in to a mince. Put in a bowl with half of the paste mixture and mix well. Roll in to 16 meatballs and put on a baking tray and put in the oven at 190C for 25 minutes. 3) Heat a little oil in a pan and add the shallots and the rest of the paste and cook for 1-2 minutes. 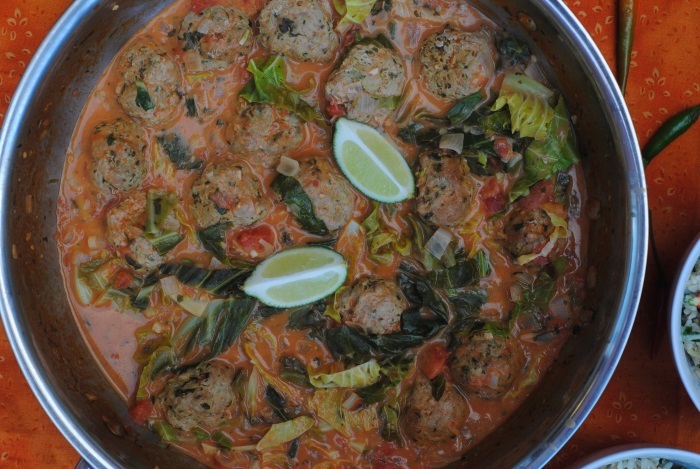 Add the coconut milk, chopped tomatoes and the cooked meatballs and gently simmer for 10 minutes before serving. Do you host a lot of dinner parties? Any funny stories to share? Nice healthy meal. It looks yummy too. Thanks for sharing. You are very welcome Stella. It’s annoying that we don;t have chicken mince as a staple in our supermarkets but food processing is a great idea. Actually you can find turkey mince so it’s odd you don’t get chicken! This sounds delicious. I am loving coconut milk at the moment. So fragrant and tasty. We can get chicken mince in our Asda in the Halal section. But I prefer to just mince it myself as it’s much cheaper. Such a big fan of dinner parties – especially murder mystery ones when things get hilarious and bizarre. I have had so many affairs when it comes to murder mysteries…. I have never done a murder mystery night. It’s something that I really want to do though. I agree, mental health is really important. With so much stress around us, relaxing is key to unwind! 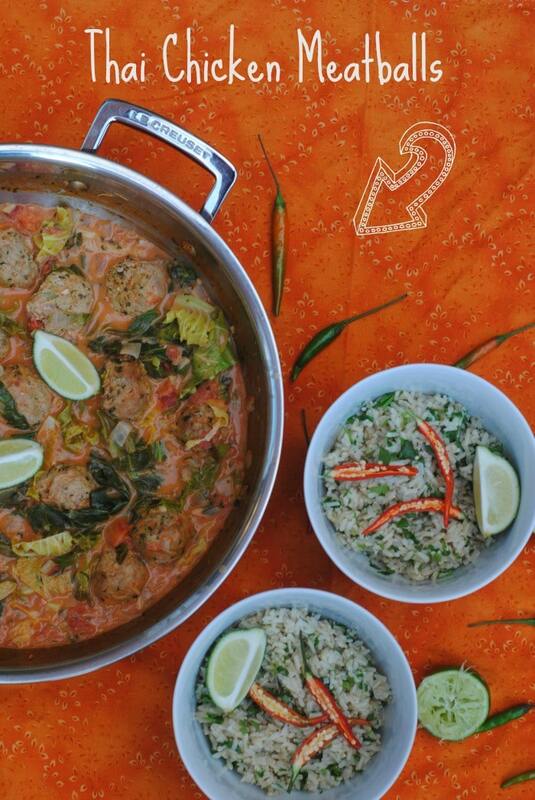 Thai spiced meatballs look very delicious, Dannii! I’m obsessed with Thai food and these pictures, are making me drool! Exactly! And one night off isn’t going to do any harm. I just LOVE the sauce that you made for these meatballs! They sound so so good! And I totally agree – having lots of water available at parties is key! I am recently discovering that Thai food is my favorite type of food. I. Am. Obsessed. So I definitely need to try these! Welcome back, by the way! I hope your trip was AMAZING! I am a little bit obsessed with Thai yellow curry at the moment. I will share the recipe for that very soon. Thai food is amaaaazing! Those meatballs look to die for 🙂 Can’t wait to hear more about your trip and all the delicious food you ate! It’s going to take a long time to write up, but I will be sharing it soon. We made these for dinner last night and they were lovely. We added a bit more chilli though. Great to hear that you had an amazing time, looking forward to the recap. I just love Thai food! It’s so full of flavour, isn’t it. Your trip looked incredible, so glad you’re using it for cooking inspiration too! I picked up lots of tips whilst there, especially when it comes to making spice pastes. How long would these keep as leftovers? Thanks. No more than a day or 2. I can’t wait to hear all about your trip. I really enjoyed yours Instagram updates. My tip for hosting a healthy dinner party is to ask guests to bring a dish if they want something specific like gluten free. I always like to offer to take a dish when I go to a dinner party. Oh wow, these sound incredible! So healthy and full of flavor. Thanks for the recipe, Dannii, and I’m looking forward to hearing more about your awesome trip! That’s what I love about Thai food, it is packed full of different flavours. That is awesome that you had such a great time in Thailand! I bet the food is awesome!! These meatballs sounds so flavorful! What a great meal! The food was incredible Izzy. 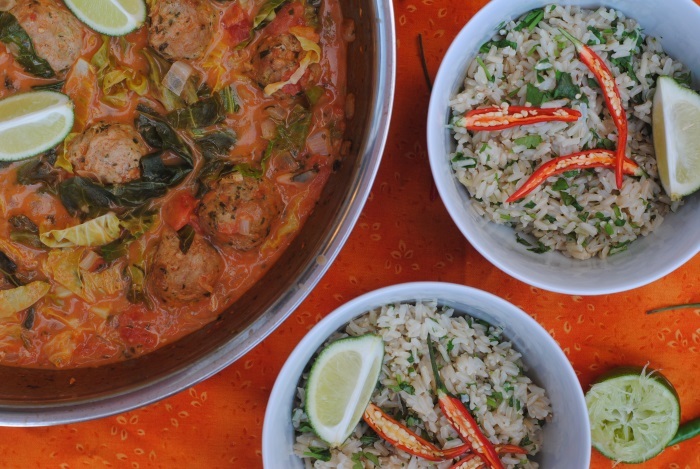 I love Thai flavors — these meatballs look delicious! It has quickly become one of my favourite cuisines. These meatballs look amazing!! I need to make these immediately! I’m so glad you had fun, Dannii! And it’s great that you’re using the trip for cooking inspiration for all of us! I am so jealous of your trip to Thailand. It is somewhere I have always wanted to go. I guess I will just have to imagine I am there by eating all this delicious Thai food haha. You definitely have to go. It is such a beautiful country. Hello!! So fun to meet another “Dani” on the interwebs – even though we spell it a bit differently :). Thai flavors are some of my favorites, and these look delicious!